Today I will be talking about something a little bit different then my usual topics, gaming. I've played video games since I was very little and as I grown up so have the gaming consoles so this year for Christmas I asked for a Nintendo 3DS XL (because I sold my old Nintendo DS last year) and I got it! Anyways in honor of my love for gaming I will be starting a new series called "Game of the month" where I share my favorite game of the month. I might not post a favorite game each month but when I have a new game that I'm loving I will let you guys know. 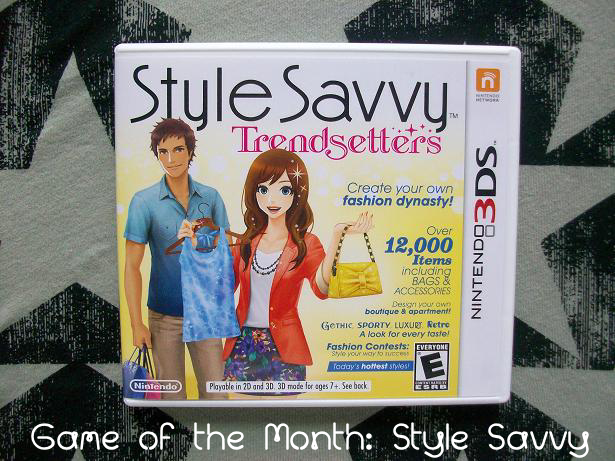 This month's game is Style Savvy: Trendsetters. Style Savvy: Trendsetters is a fashion and beauty game where you can run your own boutique and style everyone in your city! Along with styling people you can also change your hairstyle and hair color, enter contests, and you also get your own apartment too, which you can decorate. I've been obsessed with this game for the past week and love it! You are always busy and never bored with this game.I would totally recommend this game if you love fashion, styling, beauty, and anything else girly. You can buy Style Savvy: Trendsetters here. Down below I posted some snapshots from my game, enjoy! You can also style your shop's window mannequins and customers can buy the whole outfit! Which I found really cool! You can also dress men too! Style Savvy: Trendsetters also offers a variety of different styles such as sporty, punk, girly, gothic, princess, and more! Have you played Style Savvy before?